Derrick sets up a selfie for his souvenir crab at Al Covo. 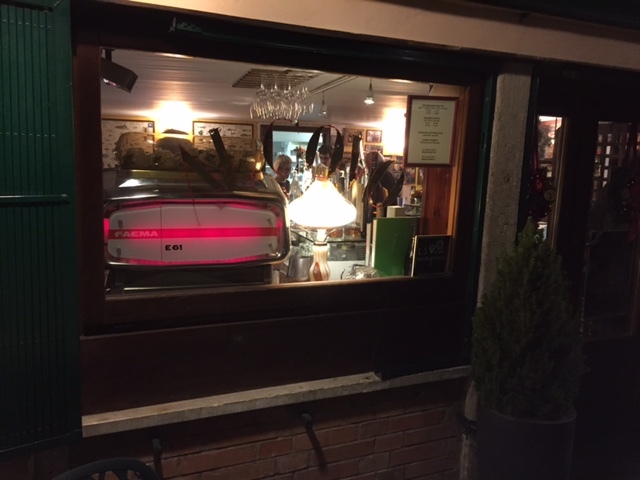 We ate at a range of restaurants in Venice and Florence over the Christmas-New Year week. Florence has become a hot spot for New Year’s Eve and fortunately we were able to make reservations well in advance. However, on New Year’s Eve itself most of the good restaurants offer only an (overpriced) fixed menu or are closed so that their chefs can cater private parties. We decided to spend that evening at a wine bar (see below). The outside of Al Covo, on a side street near the river and the San Marco Square. We discovered that Diane Rankin Vanelli, who’s the co-owner along with husband Cesare Vanelli, is a native of Texas! A road near Houston’s international airport is named for her family. Osteria di Santa Marina is an old style restaurant, fairly formal, but the food was well prepared, and they made ample use of truffles. Their seafood was absolutely fresh and delicately prepared. Al Fontego dei Pescatori and Vecio Fritolin were enjoyable restaurants, but neither was particularly distinguished. 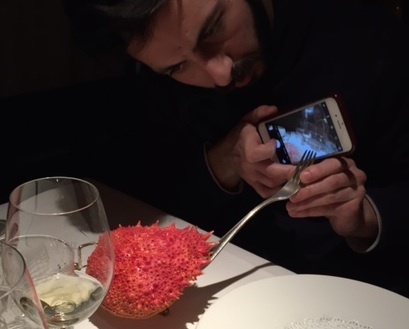 Their dishes weren’t innovative and while properly prepared didn’t show unusual technique. 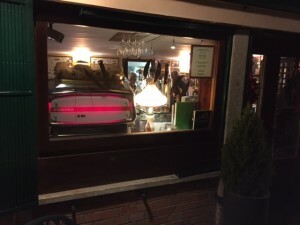 Florence is famous for the quality of its steaks and we saw why when we ate at Osteria De Benci. Their steak produced ‘meatgasms’ and was grilled to just the rareness we had requested. Osteria De Benci is also justly known for its pasta cooked in red wine. The wine flavor combined with herbs and pepper to flavor the pasta wonderfully. Another night we ate at Cucina Torcicoda. Their steak, while good, had nowhere near the flavor of the one at Osteria De Benci, and their other dishes were uninspired. The food and wine at Cucina Torcicoda also were overpriced relative to the other restaurants we ate at in Florence and Venice. 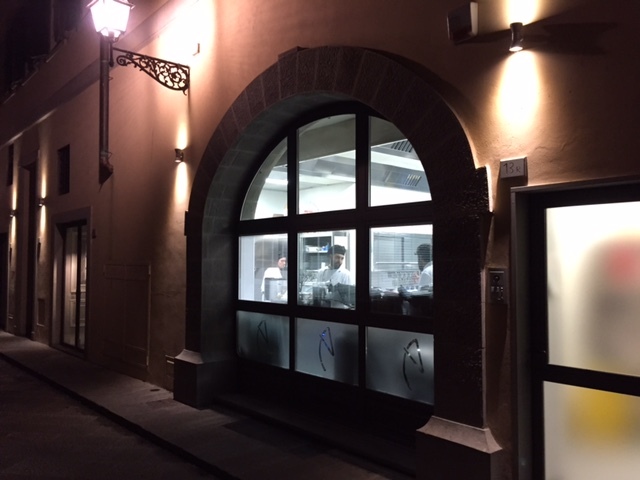 Those walking past Ora d’Aria can watch the staff creating the evening’s specials. Il Santo Bevitore is a fun restaurant in a beautiful space with very good but not innovative food. However, I want to highlight their wine bar next door, which my son and his girlfriend found while waiting for the rest of us to show up for dinner. 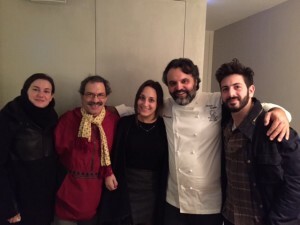 While the menu there was small—meat and cheese plates and a few warm dishes such as soups and meatballs—the quality was uniformly excellent and their wine selection was varied and inspired. This is where we ate on New Year’s Eve at a much lower price and a much higher level of enjoyment than we would have found sitting through a prix fixe at a restaurant. Our best meal in Florence was at Ora d’Aria. Dining here is as pleasant as it is delicious. The chef is an innovator and combines local ingredients with ones brought in from further afield. 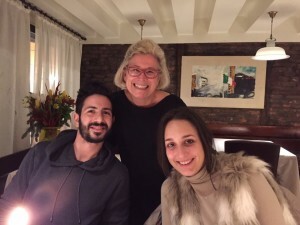 They offer meat, pescatarian, and vegetarian tasting menus as well as an a la carte menu, although they are fairly rigid about allowing a table to order only a single tasting menu if some are ordering a la carte. If every one orders a tasting menu then they allow two different tasting menus at the same table. Their vegetable and seafood dishes are more interesting than the meat ones. The family poses with Marco Stabile, the chef behind Ora d’Aria. He looks like my image of the artist in Jandy Nelson’s I’ll Give You the Sun. Beyond the restaurants, we very much enjoyed the new Mercato Centrale in Florence. The downstairs remains a food market with retail stands of meat, produce, spices, oils and more. The upstairs has been turned into an upscale food court with numerous stands at which dishes are prepared on the spot. While the quality of the food is not quite the level of Barcelona’s Boqueria or Eataly in New York City (although it is the equal of other NYC food markets such as Gansevoort, Gotham West, or Chelsea Market), the food overall is very good and it is a fun place to spend time and to eat. I was less impressed with ice cream in Venice and Florence. Perhaps the selection is smaller in winter than summer, but even the choices offered at the most highly touted shops in both cities were less flavorful than at the great ice cream parlors of Rome or our local favorites in the East Village. 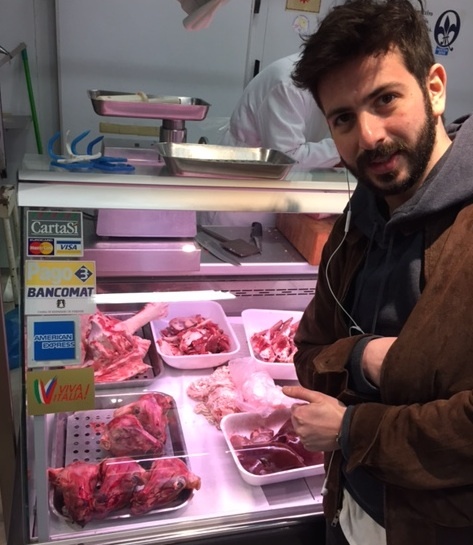 Derrick checks out the fresh meat at the Mercato Centrale. Wow, Lin and Richard! 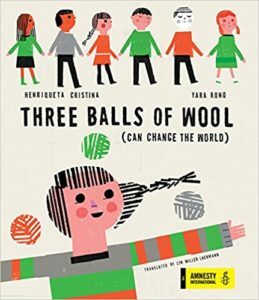 Another fabulous guest post! Hope you both are doing well. 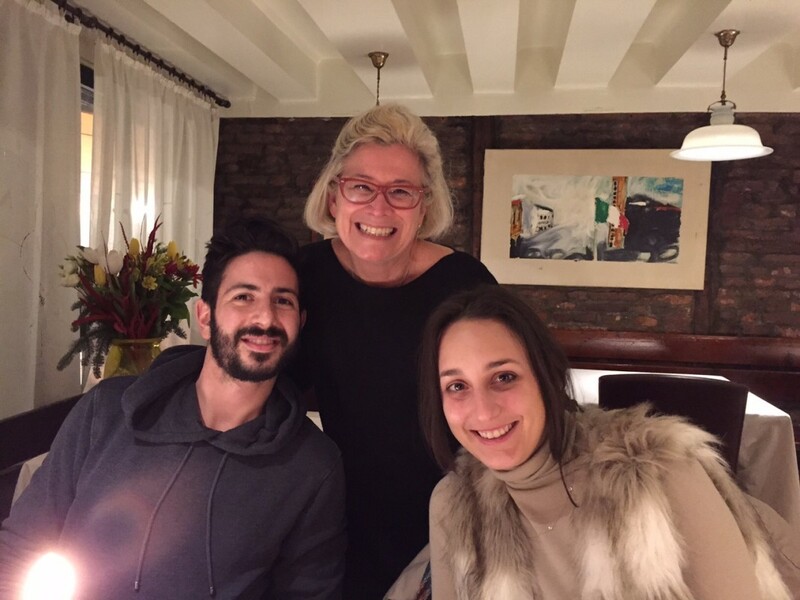 Sending all my best for 2016! I hope you had a happy holiday season! I kept up with your travels somewhat through your daughter’s Instagram posts but look forward to hearing more. We’re going to be in Portugal during May and June, so we should plan to get together! Thank you, Richard! And thank you, Lyn, for featuring Richard’s post. I so envy you the culinary experiences you had in Italy! Thank you for writing in, Linda! I enjoy hosting Richard’s posts because his dream job is food writer for the New York Times, but since that’s not going to happen, I can at least give him a platform for his work. I can also track sometimes when people check out the restaurants’ sites (and possibly make reservations), so I know when his reviews have impact. La Cervejeria da Esquina, in particular, needs to give us a better table (as in, not by the door in winter) the next time we come in.